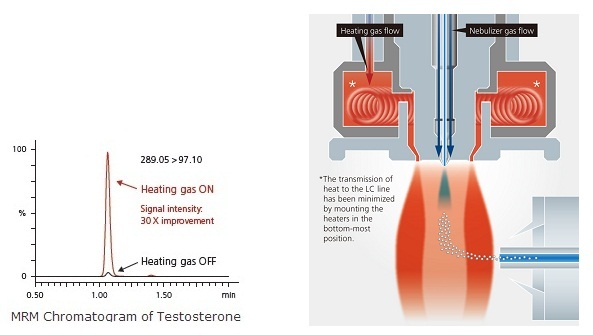 In order to improve desolvation efficiency, the newly developed heated ESI probe combines a high-temperature gas with the nebulizer spray, assisting in the desolvation of large droplets and facilitating ionization. This development allows for high-sensitivity analysis of a wide range of target compounds. Both sensitivity and reproducibility are essential when establishing low limits of quantitation. 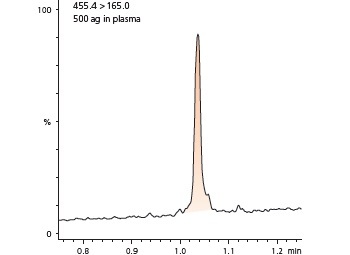 High-precision quantitative results obtained with the LCMS-8050 in the analysis of Verapamil in blood plasma at levels between 500 ag and 50 pg are shown below. Excellent reproducibility with a % RSD of 2.77 % was obtained when analyzing just 500 ag of Verapamil. The LCMS-8050 demonstrates optimal performance for quantitative analysis of even trace components of a complex matrix.